Multi-committee access in ByCommittee Promotion & Tenure! 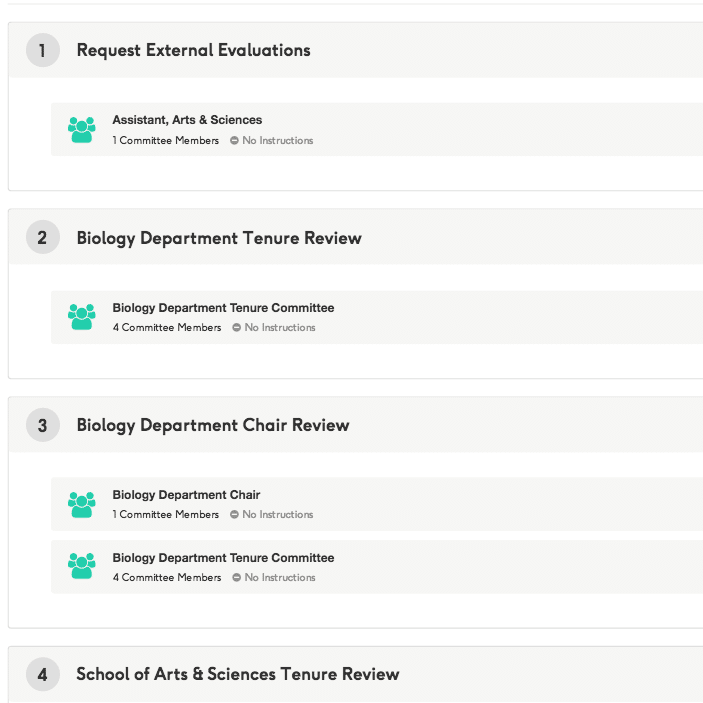 Starting this month, ByCommittee Promotion & Tenure allows you to include any number of separate committees at any individual review step, instead of just one committee per step. It’s the newest installment in this year’s collaborative developments arising from direct input from our campus partners. So let’s talk about the new capacity for multi-committee access, what our university partners needed it for, and how they’re going to use it. Why did we need it? Before now, we had deliberately made it so that a digital candidate packet in ByCommittee could only rest “with” any one committee at any given time. That’s because we were trying to digitize the movement of the tenure “binder”—the physical bundle of papers that represents the candidate’s academic career. Over time, though, we heard from at least half of the schools using ByCommittee Promotion & Tenure that sometimes they needed multiple separate groups to do different things at once with the candidate packet. So we separated out workflow steps from committees. What, then, are people doing with multi-committee access in ByCommittee? The challenge: This is when the institution’s tenure policy assigns an individual, usually a tenured faculty member at the institution, to formally “present” the candidate’s case throughout the process. They might be a kind of advisor for the candidate, or else an impartial figure outside the candidate’s department. The school’s tenure review policy requires the presenter to have access to the candidate’s packet, and know about the current review stage throughout the process. At the same time, the committees add internal materials to the candidate’s packet as they complete their reviews, and the presenter—who is not reviewing the candidate—should not have access to that information. The solution: At every step where there is committee review, the institution adds both the review committee and a separate one-person committee composed only of the presenter. When the review committee adds documents and comments to the packet, the committee can keep these invisible to the presenter. The presenter still has access to all of the materials submitted by the candidate, and still receives notifications when the packet moves from one workflow step to another. The challenge: At some colleges and universities—for example, some public institutions bound by collective bargaining agreements—the institution might be legally required to give a tenure or promotion candidate substantial access to their own case as it proceeds. In addition, in these cases, the institution may be required to give the candidate an opportunity for “rebuttal” after every review step. At the same time, obviously, the candidate is not a member of any of their own review committees, and should not have the ability to take actions as a committee member or alter their packet (except when invited to do so by the committee). The solution: At every step of the workflow where the candidate is required to have access, the institution adds both the review committee and a separate one-person committee composed only of the candidate. The candidate can see the documents added by the committees at previous steps, but has no access to the workings of any review committees at the current step. The challenge: Some schools have a tenure or promotion process in which every committee must retain some level of access to the candidate’s packet throughout the process, even after they’ve completed their specific review of the candidate. Since these previous committees are of course distinct from whatever committee is currently expected to complete their review, they can’t be “in the same room,” so to speak, as the current review committee. The solution: At every step in the workflow, the institution separately adds both the current committee and all previous committees. Only the current committee for that step is designated as “Primary”—meaning only they can send the packet forward or backward. All the previous committees can still see the past work that has been done up to this point, but the current committee makes their changes in private. As always, however, it’s really our partner campuses who will show us what’s most valuable about this feature and tell us what, if anything, they might still need. Let us know!